Mobile access to the carburetor adjustemnt feature has been disabled due to the publishing of our mobile app. 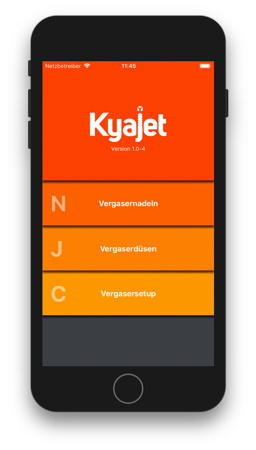 Now you can use Kyajet on your mobile phone without internet connection! So you are much more independent if you want to check your setup on the road or if you want to tune your carburetor with friends. Visit the AppStore now and download Kyajet for your iPhone. Use the following link to refer in forums or on other pages on your setup data. Please finish your setup first, before you use this function. Kyajet at the iTunes AppStore!